I rarely travel for just fun of it. I usually have some goals; something to learn or something to discover at places to which I want to visit. Altiplano was on my back burner for a long time. Altiplano is a high altitude plateau second in size only to the Tibetan Plateau. It covers part of Peru, Columbia, Chili and Argentina, see picture. It is located at an altitude of about 4000 meters. So it requires some acclimatization for high altitudes. This is why I started my trip from Lima and move slowly to high altitude areas. It was my third time in Lima, previous trips were in 2002 and 2011. Lima became better each time I visited it. This time I was pleasantly surprised by discovering a few good bike paths through Lima. But main thing about Lima is how Limenos love their city. I stayed in http://www.flyingdogperu.com/ which is nice and centrally located. After Lonely Planet stopped to provide information on inexpensive hotels, I switch to http://www.booking.com/ which usually does not even require a credit cards for reservations. I still buy Lonely Planets, but mostly for PDF Chapters and maps, which are still better then in other tour books. I use maps from my smartphone, but I still would like to have paper maps also. From Lima I went to Arequipa, 2,335 m, and I took a collectivo to Colca Canyon, with the intention to ride my bike down along the canyon rim to Cruz del Condor to see the famous Andean Condors. I aborted this attempt in the middle of it due to hurricane strong front winds and hitchhiked back to Arequipa. Anyhow, I saw that condor in my 2002 trip. http://www.foldabikes.com/CurrentEvents/Story/SouthAmerica2.html It flew right above my head, quite impressive bird with wingspan 3.2 m. I heard that now 13 years later it is not even guaranteed to see this bird during standard day long excursion from Arequipa. From Arequipa I went to town Puno on lake Titicaca 3,232 m. On my way to Puno, the bus passed through town Juliaca, pronounced (хуяка, Cyrillic), which sound quite funny in Russian. I took standard boat tour to see famous floating islands made from reeds. I followed Lonely Planet recommendations and arranged tour not from international tour agencies located in the center of town, but from one of companies run by local people, located directly at the pier. So that my few dollars will go to local businesses, not to some international multimillion dollars corporations. All these tours are standardized and about the same, however they are quite interesting if seen for first time. It was my second time. On our way back, it was strong tail wind and waves. In spite of the captain's best efforts, the boat was turned sideway, more and more. Once the captian was unable to turn the boat perpendicular to an oncoming wave and the boat was hit quite strong from side by big wave. It was not overturned yet, but engine abruptly stopped. Capitan tried to restart engine. The ignition switch was pulled out from dashboard and was hanging on wires, one of them was broken. So in order to start the engine, the captain had to connect these two hanging wires, which was not easy as the boat was rolling very strongly. The captain tried several times. Each time the engine started and immediately stopped. Another big wave hit the boat. The boat was not overturned yet again, but unsecured chairs fell down. One passenger open a window and started shouting something to passing boat. Capitan tried again and miraculously, the engine started. Capitan turn boat perpendicular to waves, we were saved and I escaped a chance to be remembered as a person who drowned in lake Titi Kaka. From Titicaca I went to LaPaz 4,058 m, capitol of Bolivia. Visa for Americans is $160. It was punishment of socialist president Evo Marales for American capitalists. While some American capitalist, like myself, definitely were punished, revenue from tourism for Bolivia definitely declined as a result of this outrageous fee. La Paz is least appropriate town for bicycling. Streets are steep. Sidewalks are narrow and covered with vendors. It is a lot of traffic. I was the only bicyclist in the entire town. From LaPaz I took a night bus to the town of Uyuni, the starting point of Bolivian altiplano exploration. Tour routes and prices are highly standardized. So it is difficult to make selection between tens of companies. It is not feasible to have an independent trip to the Aliplano. Every tour is based on 4 wheel drive Toyota land cruisers. Tour groups consists of six tourists, a guide and driver. Most important is who will be your companions for three days and who will be your guide. So it is best to delay the moment of payment as long as possible and try to see these people and guide before you pay. However delaying for too long is also dangerous, as groups get completed and will not take any more people. My success was moderate. My group consisted from two young Australian/New Zealand musicians with heavy accents. I understand only one word they frequently used- "f u c k". The other two were also relatively young New Polish (by analogy with New Russian) guys. The same as their Russian comrades they relatively recently escaped from socialistic misery and now want only the best; best accommodation, best food, best everything; which is quite ridicules to expect from a rustic field expedition. I even advised them next time to go on cruise ship tour. The guide was good, not very knowledgeable on altiplano stuff, but natural comic, who helped smooth inevitable conflicts. 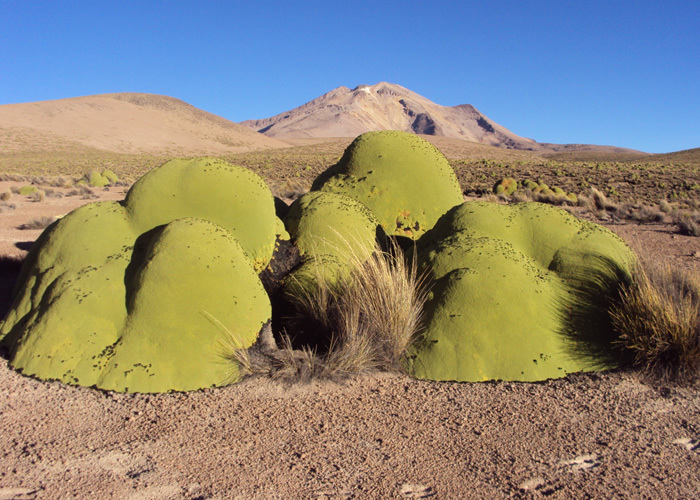 Bolivian altiplano is one of the natural wonders of the world. 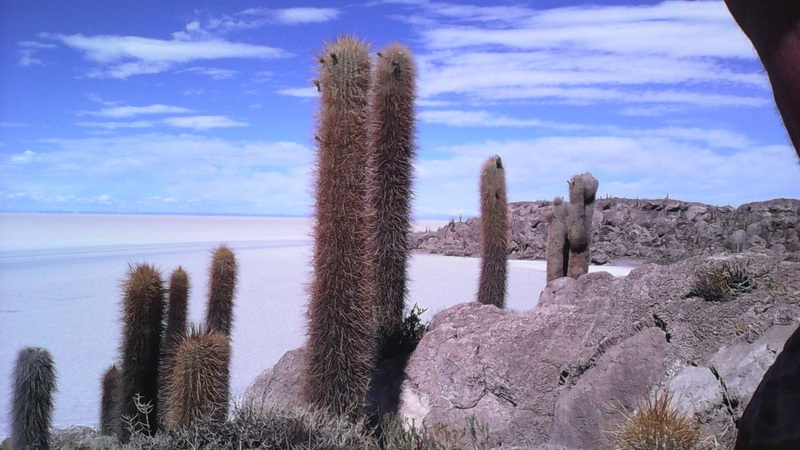 The most impressive is Salar de Uyuni the world's largest salt flat. It is 3,000 km long by 3,000 km. wide, an absolutely flat mirror. Satellites use it for the calibration of their instruments. 13 years ago it was sparklingly white. Now it is a little bit brownish. Deforestation of surrounding hills, and dust storms contaminated the salt flats. Other attractions, mad volcanoes, geysers and colorful Lagunas are not changed. But the numbers of pink flamingos has considerably reduced. Constant tourist pressure takes its toll. Unfortunately in our tour we did not see one thing which impressed me the most 13 years ago, Azorella Compacta tree, see picture taken from the internet. It is actually a tree with compacted (as name suggested) leaves and branches. It adopted to the most harsh weather condition on the planet, and it may be several thousands years old, as it grows very slowly. I do not know why it was not shown to us; it was in order to protect them, or may be they all were cut for souvenirs. The tour ended at the Chilean border crossing near Laguna Verde 4,300 m. From there I rode my bike down to San Pedro de Atacama 2,400 m. It was very cold up there and I put on gloves, hat and all my clothes. I do not have to pedal a single stroke. Road was strait as an arrow and pretty steep. When I stop at Atacama desert, it was steaming hot. I open my backpack and things inside were still frozen. Chilean part of altiplano is much smaller then Bolivian, but it has the same features as Bolivian: salt flats, lagunas, volcanoes, but on a small scale. The Atacama desert which covers most of Chilean altiplano is the driest place on Earth. 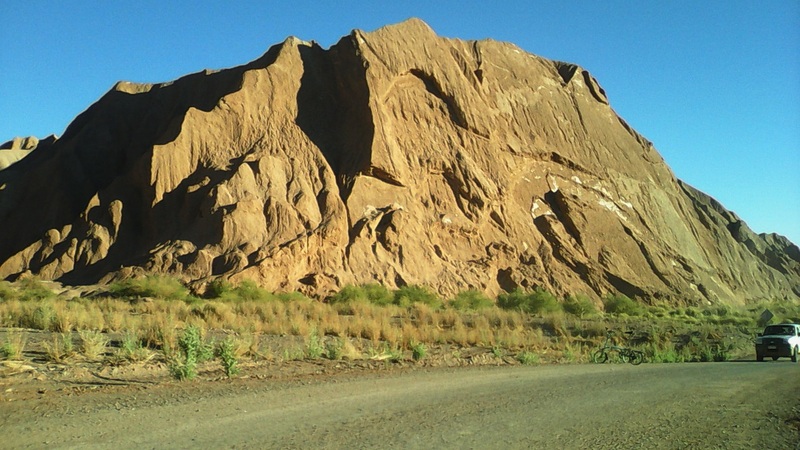 It is crossed by good roads, so it is possible to see most attractions with one day tours from San Pedro de Atacama. It is also possible to do it on rented car. I did some exploration on bicycle, which is best. I even managed to get lost in the desert. 2. 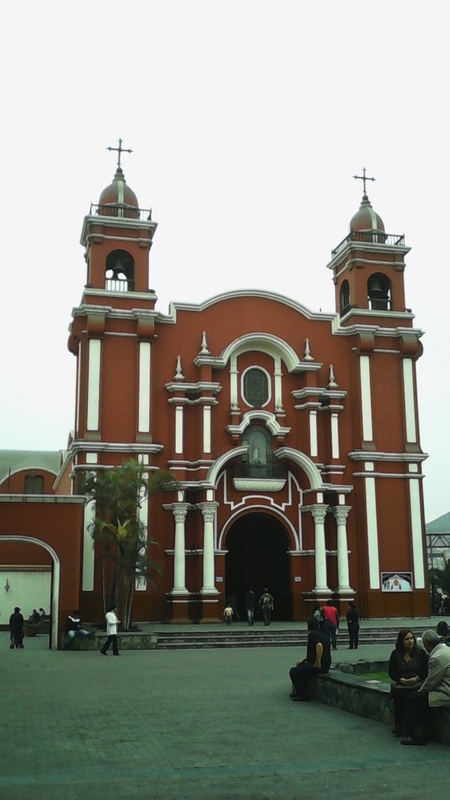 Santa Rosa Church, Lima. 3. 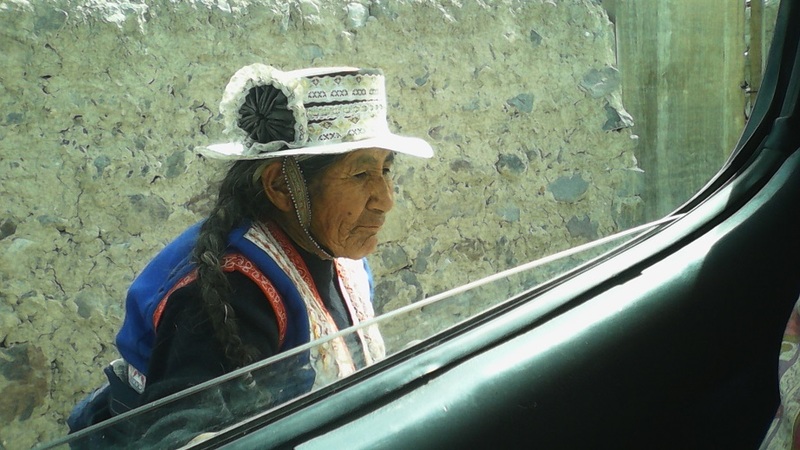 Indigenous lady hitchhiking at Colca Canyon. 4. 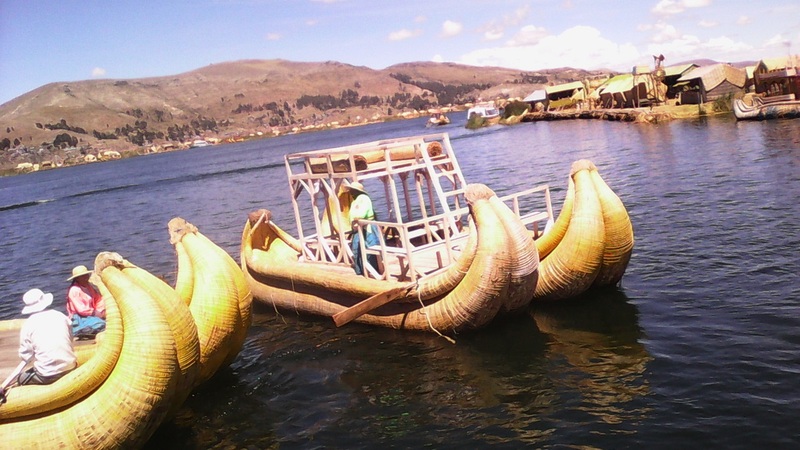 Boats made from reeds on Titicaca lake. 5. 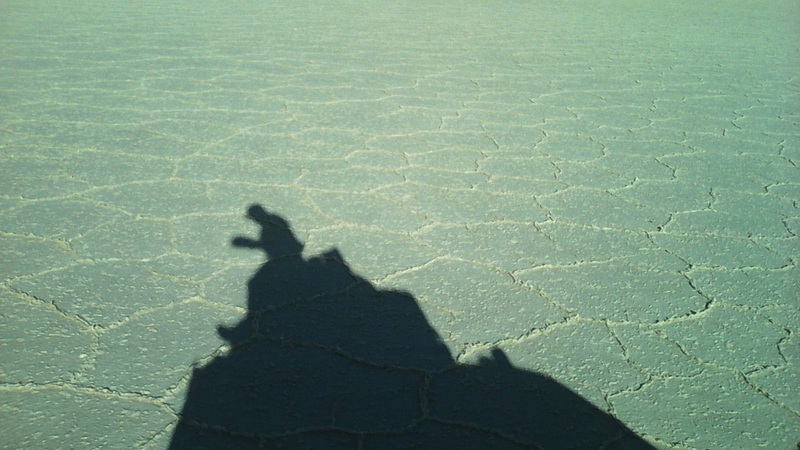 Solar de Uyuni salt flat. 6. Pescador Island in the sea of crystallized salt, Salar de Uyuni. 8. 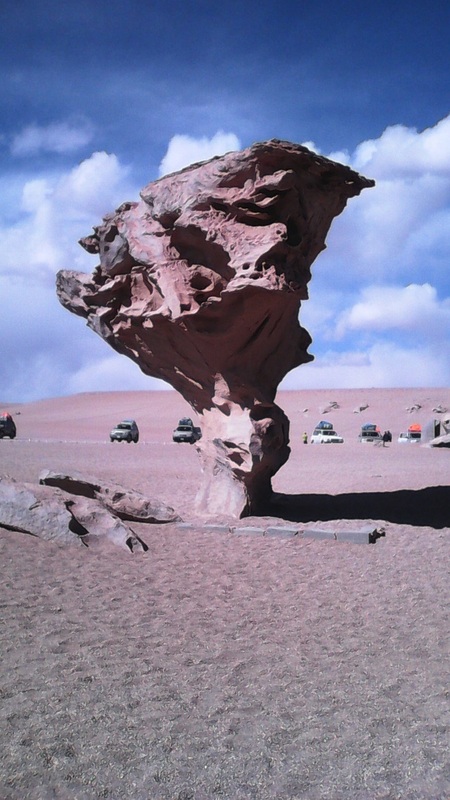 The most photographer stone tree, result of wind erosion. 10. Pukara de Quitor valley in Atacama Desert. MERRY CHRISTMAS AND HAPPY NEW YEAR TO YOU MY DEAR READERS.